When you visit Dragon’s Teeth along Kapalua’s windswept coast, you can easily imagine yourself in the mouth of a giant dragon. The unusual rock formations resemble jagged teeth jutting from a massive jaw. Visiting Dragon’s Teeth is relatively easy to do with a five to ten minute walk through the rough of the Bay Golf Course. Please keep in mind that you’ll be passing by a busy golf course where errant shots can occur, which could result in injury. Stay aware of what’s going on nearby. Stay as close to the hedge on the right side as possible (do not cut across the hole), while being on the lookout/mindful of golfers both on the tee, in the fairway and around the green. Once you approach the jaw of the dragon, so to speak, the surface is uneven, so do wear sturdy footwear and be very careful with your steps. To find Dragon’s Teeth Trail, head towards the intersection of Lower Honoapilani Road and Office Road in Kapalua. Just off Lower Honoapilani Road, you’ll see a small public parking area. There’s a small public parking lot at the top of the trail. The following Google Map shows the bird’s eye view of the area. 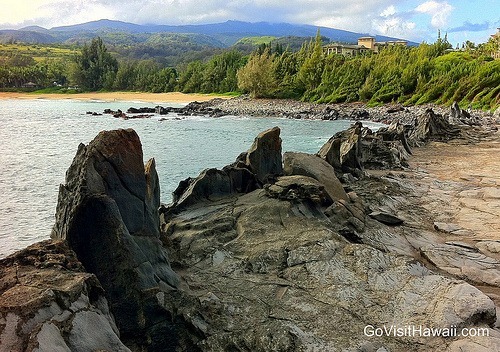 Dragon’s Teeth is flanked by two gorgeous Maui beaches — Oneloa Bay and D.T. Fleming. Feel free to check out more of our photos from Dragon’s Teeth as well as our 360 video. For more ideas of what to see and do on Maui check out our popular list of the top 5 Maui vacation activities and attractions.